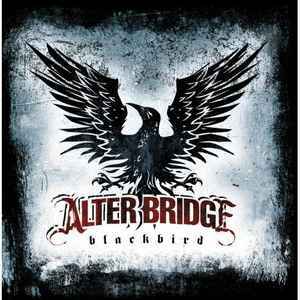 Second studio album released on October 5, 2007. I was perfectly content to ignore Alter Bridge. I really disliked Creed, so I figured there was no reason to bother with a band that features a bunch of former Creed guys. Then a friend whose opinion recommended the band’s Blackbird album. I wasn't convinced by the samples I heard, but the seed was definitely planted in my head, so when I ran across a copy of Blackbird in the cutout bin at a local record show, I decided to part with a couple dollars and see what the fuss was all about. Apparently my issues with Creed had a lot to do with their frontman, because Alter Bridge's sound grabbed right from the first moments of opener “Ties that Bind”. It's melodic and radio-friendly, but there's definitely some muscle in these songs. In fact, songs like “White Knuckles” and “Buried Alive” are about as heavy as anything Black Stone Cherry (check them out, you'll thank me later) have to offer. By and large the songs on Blackbird are really tight, completely rocking, and have great hooks and melodies. The vocals are a lot more compelling than Creed's. I did hear that dreary, post-alternative, Creed sound on the slow song “Watch over You”, but thankfully that proved to be the exception rather than the rule. The bottom line is that Blackbird rocks. I still don't like Creed, but hearing this Alter Bridge album has made me reassess my belief that modern mainstream rock has nothing to offer. Can anyone confirm the position of the individual copy number? Save for the six-digit, silver code impressed on the back sleeve following "MOV" (e.g. mine is MOV 000229) I couldn't seem to find anything. My own copy came with a golden MOV sticker hinting to the release being "individually numbered" (by the way said sticker was almost certainly taken from somewhere else, maybe the original shrink wrap, and pasted on the plastic poly envelope the album came by), so I'm quite sure it's supposed to be numbered. The sound quality of this pressing is pretty good; compared to their digital counterparts, it's nice to hear a slightly more clear guitar sound for songs like Ties That Bind. The glossy gatefold and side D etching is also a nice touch. Just wondering if this original 2007 pressing even actually exists? According to the Music On Vinyl website, they are doing a run of 1,000 on Red Vinyl with "Limited 10 Year Anniversary Edition in numbered sleeves"